CreditDonkey team’s ranking of the best cities to live in Massachusetts used these five key factors to determine their list. Just 16 miles northeast of Boston, Beverly is one of the oldest cities in Massachusetts. A relatively low crime rate combined with a high average wage makes Beverly an excellent choice for families and professionals. Its close proximity to Boston gives commuters access to the area’s commuter train and a short ride to the city (albeit with some company along the way), yet it also has its share of restaurants and local attractions that keep people around during their off-hours. Did You Know: Several people from Beverly were accused of witchery at the Salem witch trials. The Salem Witch Museum includes a tour of the Beverly home of a minister who perpetuated the false accusations. If you’re looking for ocean views while remaining relatively close to the metropolitan area, Gloucester is the place to be. Residents are able to score an average commute of under 25 minutes, although those who commute to Boston will have double or triple that amount, depending on whether they take the local train or drive during rush hour. While there are plenty of places to enjoy a good meal – including fresh fish – or have a drink, you’re just a stone’s throw from Ipswich, Rockport, and Essex, which offer even more options. Did You Know: Gloucester shot to fame when all six crew members on board the Andrea Gail lost their lives during a 1991 Nor’easter, the storm documented by local author Sebastian Junger in his book “The Perfect Storm.” The movie based on the book was filmed here. Woburn ranks third on our list partly because it’s one of the safest places to live in Massachusetts. Wages here are also slightly higher, with incomes averaging just over $72,000. Woburn ties with Waltham for the shortest commute time, clocking in at just 24.2 minutes. Did You Know: Olympic figure skater Nancy Kerrigan and actor Eric Bogosian were both born in Woburn. Once part of nearby Watertown, Waltham earned the nickname the “Watch City” thanks to the Waltham Watch Co., which produced over 40 million watches and clocks here in the 19th century.Less than 10 miles from Boston, Waltham is home to Bentley College and Brandeis University. The city features active nightlife and an eclectic dining scene, topping our list with 260 restaurants and bars to choose from, many of them on Moody Street. Did You Know: High-profile employers based in Waltham include defense contractor Raytheon, online marketing company Constant Contact, and StudentUniverse, a tech company that offers discount travel services to students. Another community located in the North Shore suburban region, Peabody is a retreat from the big city life for both students and professionals alike. Peabody once made the Forbes magazine top 100 list of best places to live in 2012, thanks to its high median income levels and below average home prices. That’s a designation we believe is well deserved. Did You Know: Giles Corey, who was infamously pressed to death during the Salem Witch trials, once owned a farm in Peabody. If it’s natural beauty you’re looking for, Westfield features rich farmland, scenic stretches of rolling hills, and plenty of rivers and streams ideal for fishing, kayaking, and canoeing. At 23.4 minutes, Westfield has the shortest commute time on our list, mainly because if you live here, you work near here. While it ranks at the lower end in terms of median income, the cost of living is less than what you’d pay in an urban setting. Did You Know: Once inhabited by the Native American Pocumtuc tribe, Westfield was originally known as Woronoco. Approximately 30 minutes west of Boston, Marlborough ranks number two as the safest city on our list. Convenience is the main reason to live here, as the city provides easy access to three major highways for fast getaways and for getting to work in either Worcester or Boston. It has its own action as well, with a major hockey sports center, a big mall, restaurants for just about every taste, and two Targets. Higher income rates and corporate residents Boston Scientific and TJX (the company behind TJ Maxx) are a big draw for the under-40 professional crowd. Did You Know: This city with a small-town atmosphere was known for a century as “one of the shoe manufacturing capitals of New England,” according to local historians. The only sign of that time is a shoemaker statue and a Reebok outlet store near the downtown area. Thanks to its historic seaport, Newburyport is a bustling tourist spot, but it’s also a great place to call home. Wages here are among the highest, averaging $83,509. Even though the commute is little longer, driving to Boston is bearable, and the city has a commuter rail stop. The crime rate here is moderate, and there are plenty of local dining spots that feature everything from New England favorites to New Orleans-style cuisine. Did You Know: Since 1957, residents have celebrated the Yankee Homecoming, an annual festival commemorating the return of natives to Newburyport. 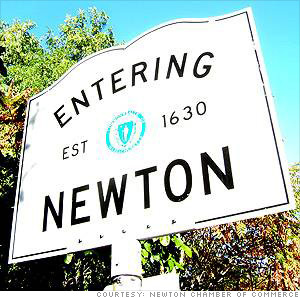 A conglomeration of 13 villages, Newton ranks number one on our list for the highest median income. The Chestnut Hill area is home to Boston College, and Newton is located centrally between Boston, Waltham, Brookline, Wellesley, and Needham. The city has a strong tourist trade, but it’s also recognized as a thriving college community with a strong artistic and cultural presence. Did You Know: Newton is usually the top-ranked Massachusetts city in “safest city in America” reports, and, in fact, has earned the top spot a few times by an oft-cited report by Morgan Quitno Press. It may have something to do with the town-like feel this community offers. Once known as the jewelry capital of the world, Attleboro is less than a 10-minute drive from nearby Pawtucket, RI. A significant part of the city’s population commutes, either to Boston or Providence, with the average commute time squeaking in at just under 30 minutes. Did You Know: The Capron Park area features a popular zoo that’s a big draw for local residents and visitors.